Maybe you had the pleasure to meet a Salvation module already, maybe not. But if you are starving for the right, full, keen-edged and fresh guitar sound then we think you owe it to yourself to check these unique mods out. With an innovative approach, open-minded solution and real player requirements, Salvation Audio have created a plethora of truly extraordinary masterpieces! In the living heart of Europe there is the expertise, experience, and genius of the Salvation Audio Team. Enter one Anthony Salva - amazing, young, skilled, experienced and inventive artisan extraordinaire. But why just Randall MTS modifications? In the beginning, some 15 years ago, it was the Fender, Soldano, Rivera alike – fixing, setting, repairing and modifications of authentic, world-renowned amps. Working on Marshalls, Bogners, Diezels, etc, he has met the amazing Egnater/Randall modular preamp idea and bought RM100 and few modules. And as you may have heard, these stock modules are very good and employ a groundbreaking new platform. But we sought to expand and explore further possibilities to further refine these stock moduling introducing the absolute highest grade components and engineering to unleash even greater improvements and advances. An improvement in dynamics, harmonic content and wider tonal palette was the driving motivation. Anthony decided to take a bold leap and convert his own favourite Soldano amp into a Modern MTS module. Eureka! 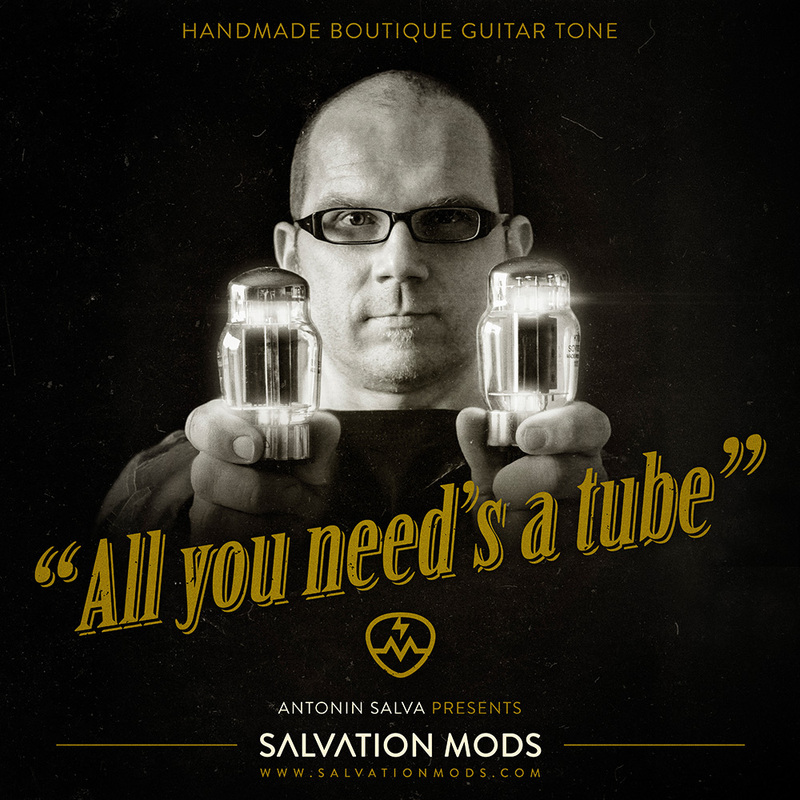 The very first Salvation mod was born, the flagship Soldano based and aptly named "Salvado“. It was an astounding achievement, which had just cracked open the door for even more possibilies. Soon, a crunch channel switch was added, then even more versatile features were shoe-horned in. Everyone who heard it, loved it. It just sounded great, true to the integrity of its origin model with so much more to offer. And it was also important because at its core was an engine entirely different then all stock modules. This opened the door even further, so we had a very broad base to choose from as opposed to typical Marshall derivative starting points. We have to say there are not only "modifications“ of MTS modules. These were to be completely new circuits built inside, so we can say – this is REENGINEERING in a greater sense. Custom-made sound sewn into the MTS infrastructure, which can not only be introduced as new classic mods, they can be custom tweaked on your demand to the most minute aspect of your taste and needs, truly realizing your own dream amp sound. Using top quality components and solid core silver plated wiring, hand-wired in the heart of Europe, Salvation Audio means you have direct access to monumental upgrade possibilities and enhancement borne of the original core modular MTS platform. You are so close to legendary amps sound than ever before possible. And much more over it – you get many added features expanding authentic sound and removing existing limitations. With these boundless sound features you may suddenly explore a new realm of guitar sounds from the immediately familiar classic at its truest to new tones never heard before. Honesty, Integrity, Pure Art for the Purist Artist. This Salvation Audio module portfolio covers and precisely maps sound and spirit of the majority of legendary amps of several last decades. You can look forward for dynamic, full-bodied, articulate, full-spectrum sound with killing attack, which can examine with your own your guitar, skills and ability via our unique Global Custom Shop. Just be ready to play and we will arm you with your own powerful, personal weapons of choice. You'll be confident, armed and ready! That is just what we love to do. Make your dreams reality. A labour of love, if you will. We are always excited to realize the next challenging vision from our discriminating clients. Now it is your turn. Want to know more? Please review our website and catalog. Also, please meet the Salvation Audio Team, who stand at the ready to fulfill your wildest tonal needs! Note: Salvation Mods was our older company name, now we are Salvation Audio. ... and also we get by with help, love, and support of our friends and families! Thank you all!